An international team of researchers, led by Johannes Krause and Choongwon Jeong from the Max Planck Institute for the Science of Human History (Jena, Germany), and Abdeljalil Bouzouggar from the Institut National des Sciences de l'Archéologie et du Patrimoine (Rabat, Morocco) and including scientists from the Mohammed V University in Rabat, the Natural History Museum in London, University of Oxford, Université Mohammed Premier in Oujda and the Max Planck Institute for Evolutionary Anthropology in Leipzig, have sequenced DNA from individuals from Morocco dating to approximately 15,000 years ago, as published in Science. This is the oldest nuclear DNA from Africa ever successfully analyzed. The individuals, dating to the Late Stone Age, had a genetic heritage that was in part similar to Near Eastern populations and in part related to sub-Saharan African populations. North Africa is an important area in the history of the evolution of our species. The geography of North Africa also makes it an interesting area for studying how humans expanded out of Africa. It is part of the African continent, but the Sahara desert presents a substantial barrier to travel to and from southern regions. Similarly, it is part of the Mediterranean region, but in the past the sea could have presented a barrier to interaction with others as well. "A better understanding of the history of North Africa is critical to understanding the history of our species," explains co-author Saaïd Amzazi of Mohammed V University in Rabat, Morocco. In order to address this, the team looked at a burial site in Grotte des Pigeons, near Taforalt in Morocco, associated with the Later Stone Age Iberomaurusian culture. The Iberomaurusians are believed to be the first in the area to produce finer stone tools known as microliths. "Grotte des Pigeons is a crucial site to understanding the human history of north-western Africa, since modern humans frequently inhabited this cave intensively during prolonged periods throughout the Middle and Later Stone Age," explains co-author Louise Humphrey of the Natural History Museum in London. "Around 15,000 years ago there is evidence for more intensive use of the site and the Iberomaurusians started to bury their dead at the back of the cave." 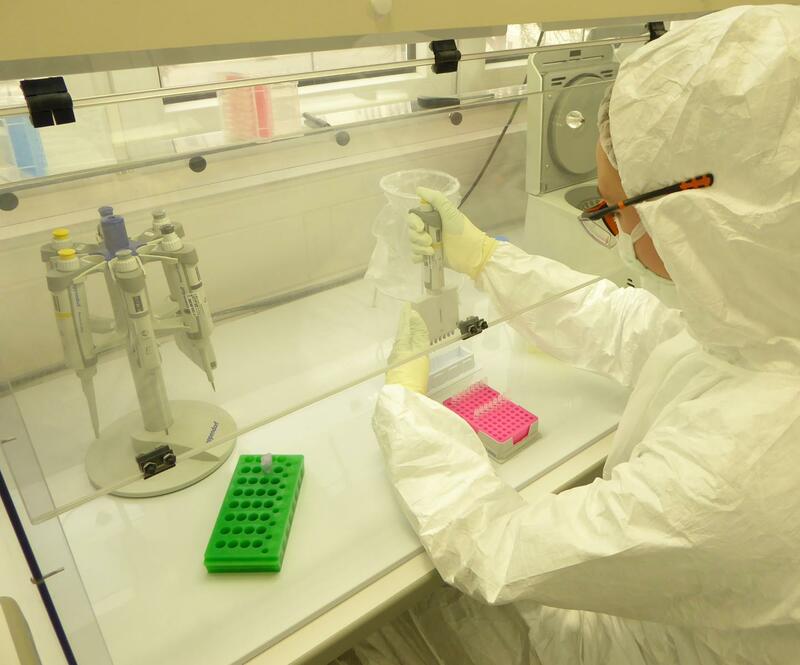 The researchers analyzed DNA from nine individuals from Taforalt using advanced sequencing and analytical methods. They were able to recover mitochondrial data from seven of the individuals and genome-wide nuclear data from five of the individuals. Because of the age of the samples, at approximately 15,000 years old, and the poor preservation characteristic of the area, this is an unprecedented achievement. "This is the first and the oldest Pleistocene DNA of our species recovered in Africa," explains co-senior author Abdeljalil Bouzouggar. "Due to challenging conditions for DNA preservation, relatively few ancient genomes have been recovered from Africa and none of them so far predate the introduction of agriculture in North Africa," explains first author Marieke van de Loosdrecht of the Max Planck Institute for the Science of Human History. "Successful genome reconstruction was possible by using specialized laboratory methods to retrieve highly degraded DNA, and relatively new analysis methods to characterize the genetic profiles of these individuals." The high proportion of Near Eastern ancestry shows that the connection between North Africa and the Near East began much earlier than many previously thought. Although the connections between these regions have been shown in previous studies for more recent time periods, it was not generally believed that humans were interacting across these distances during the Stone Age. "Our analysis shows that North Africa and the Near East, even at this early time, were part of one region without much of a genetic barrier," explains co-senior author Choongwon Jeong. "Clearly, human populations were interacting much more with groups from other, more distant areas than was previously assumed," states co-senior author Johannes Krause, director of the Department of Archaeogenetics at the Max Planck Institute for the Science of Human History. "This illustrates the ability of ancient genetics to add to our understanding of human history." Further studies in this region could help to clarify more about when and how these different populations interacted and where they came from.